That is right, If you get stuck, Our Experts are always Ready for rescue! So purchase with out worries! Earlier there were no options to recover Mails data from back up of OLK14 message files used in Microsoft Outlook Mac database, people used OLM repair tools to take care of their Outlook Mac recovery. But now, that has changed with this one and only amazing new Application that will recover Mails / Calendar and Contacts from OLK14 message files of your Outlook Mac database itself, thus making the Outlook Mac Recovery process completely error- free and without any hassle of dealing with corrupt OLM files during the process. What are OLK14 Message Files? OLK14 Email message files are file extension created and used by Outlook 2011, an email and calendar program for Mac; OLK14 Message file contains the email's header information, but does not contain the email body contents, which are stored in a separate .OLK14S file; These files are used by the Outlook Mac 2011 to display message overviews while browsing email. When downloading new email, Outlook automatically creates local copies of email messages in OLK14MESSAGE files. OLK14 message files are the individual files containing mail data stored in Outlook Mac Database. There are some application claiming to do Outlook Mac Mail recovery using OLM files. Which are actually pre-exported Archive file format from Outlook 2011 for Mac. Many a times the Archived OLM files are corrupted and don't have the entire mail data. By Working Directly with OLK14 message files, puts you at advantage that you are recovering Mail Data direct from source and will keep you out of troubles arising because of corrupt and inaccessible OLM files, thus providing you with the smoothest and most industrially advanced Outlook MAC Database Recovery experience. OLK14 Message Recovery App also comes in handy when you are not able to export OLM files and Outlook 2011 for Mac keeps crashing on you during the export process. Leaving you scared and fearing loss of your important business and personal Mail data. 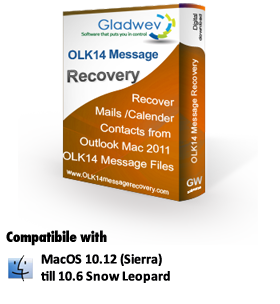 OLK14 Message Recovery is the only Outlook Mac Database Recovery Tool in the market that works with the original OLK14 Message files in Outlook Mac instead of Exported OLM Archive files. Thus the recovery and conversion process is completely automatic and does not requires you to have tech skills like a Computer geek to follow through this really simple process. The tool was designed to make the process as simple as three clicks. You can not only perform Outlook Mac Mail Recovery but a lot more can be achieved with this highly efficient OLK14 Message Recovery Tool. Using this tool you can easily convert and export the recovered OLK14 message files to a number of other formats for importing the messages in Apple Mail, Thunderbird, MBOX, PST. Our Application is Highly Optimized for Performance and Simple to use and comes backed with a guarantee of best support for your entire Outlook Mac Database Recovery Experience. We assure you of the quickest response time and solutions compared to other service providers. Protecting your Outlook Mac Mail data integrity is one of the most important aims of this OLK14 Message Recovery Tool. All of the OLK14 Message files shall be recovered, exported in the same exact manner and hierarchy as they were originally placed under Outlook 2011 for Mac Email Client.